After making apple cake, apple crisp, apple muffins, and applesauce, we had just enough apples left on our tree for an apple pie. 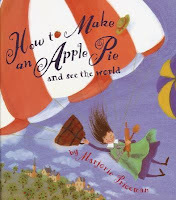 That meant we had to do some careful deliberating, as we currently have three picture books, from the library, with recipes for apple pies, included with the story. I find that amazing, because quite frankly, pie recipes are not generally, all that child friendly. 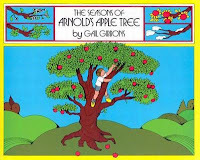 The recipes in Gail Gibbons' The Seasons of Arnold's Apple Tree, and Marjorie Priceman's How to Make an Apple Pie and see the world are essentially the same, basic pie recipe, with just slight variations of measurements. Since we've made a cherry pie following one of Priceman's recipes before, we decided to try out Amelia Bedelia's First Apple Pie recipe. In a traditional Amelia Bedelia story, the good hearted, but over-literally minded maid saves the day, for herself anyway, by producing some wonderful cake or pie, just in time to keep from being fired. 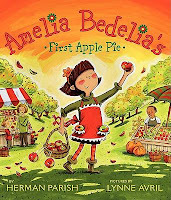 In Amelia Bedelia's First Apple Pie, we discover that she inherited her baking skills, and recipes, from her grandmother. The children weren't sure if they cared for the prequel concept, or not. While Miss Bedelia is still very literal minded, easily confused, and an excellent baker, she doesn't seem at all like the bumbling maid we're use to. I started out reading the book to my youngest daughter, who was gradually joined in listening by the rest of the children. As each child sat down, they had to interrupt by asking what we were reading, and then proclaiming, "That's not Amelia Bedelia!" Fittingly though, they were won over by her pie. The recipe at the back of the book is one we will be keeping. The crust contains not only sugar, and cinnamon, but white vinegar as well, and as strange as that sounds - it is delicious. Click here, to browse inside the book, and see the recipe, at the publisher's site, for yourself. I prefer the original Amelia Bedelia (mostly because that's the Amelia version I grew up with). However, that pie does sound quite mouth watering...more so than the the lemon meringue in the original book. Another book we like, and used last year, was The Apple Pie Tree by Zoe Hall. I am not sure how the recipe compares, but I do love reading the book. Right now we are rowing How to Make an Apple Pie and See the World so we will be making an apple pie next week. Tonight we are making apple crisp. I didn't know there were prequel books to Amelia Bedelia. Sounds like I wouldn't like them very much either. It's amazing how many books with apple pie recipes are out there. We read the first two but not the last one. Never tried to make an apple pie, because I baked a Russian version once and nobody but me ate it. I loved this book! It is sooo cute! The illustrations are superb and I like the idea of ​​walking all over the world to find the ingredients for a good apple pie '. I think I really thought the illustrations for my taste, and I love travel books, so it's perfect for me.